Come find an active adult lifestyle at our friendly Arizona RV Resort! 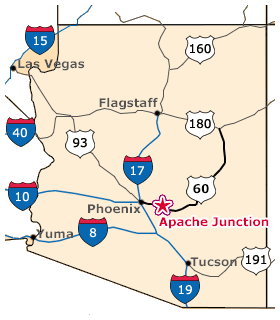 Nestled near the beautiful Superstition Mountains, La Hacienda RV Resort, offers easy access from Route 60 and is just 35 miles to Phoenix. 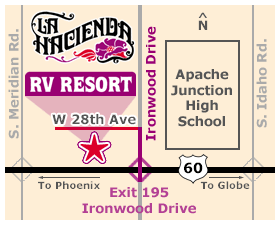 Please consult this page to help you plan your trip to La Hacienda and feel free to contact us with any questions while making your travel plans! Turn left onto W 28th Ave.